. Ever since Mitsubishi broke new ground with their first 40-inch direct-view television back in 1992, each succeeding generation of this largest of all picture tubes has delivered more impressive results. The CS-40805, top model of the 1996 series, not only takes 40-inch tube design to a new level of performance, but it achieves a standard that one might have supposed impossible when Mitsubishi first boldly went where none had gone before. Thus far, Mitsubishi remains the only company producing 40-inch direct-view televisions. Nobody else seems to be especially interested in adopting the big tubes, and indeed Mitsubishi acknowledges that, while sales of the 40-inch television have exceeded expectations, it remains a niche product. The two main obstacles to a larger market share are fairly obvious: the sheer hulk of this “table model” television, which challenges the construction of any table with its 250 pounds of dead weight, and a similarly hefty price tag: $3999 for the CS-40805. For a few dollars more, you could bring home a 60-inch rear-projection set. So what’s the appeal of a pricey, ponderous, 40-inch direct-view model? In two words, the picture. I’ve seen some really pleasing 50- and 51-inch rear-projection sets, but I’ve yet to find so large a picture with image resolution and color to match the CS-40805. Besides, as large as this television is, its 38-inch width is much less than a 50-inch projector, and it really can be placed on a table. It simply doesn’t command the wall space of a large projection model; indeed, to 100K at the matter another way you can sit closer to the CS 40805 without seeing the picture dissolve into scan lines. It can turn an apartment living room or any but the most palatial bed room into cinema verite. The technical spin that propels this television beyond its 40-inch predecessors is Mitsubishi’s new Y/C digital comb filter. The comb filter helps to isolate the color component of the video signal (known as chroma, or C) from the black-and- white component (luminance, or Y). To judge by the pure white and true colors in this picture—at least, to judge by their appearance after correction by a technician from the Imaging Science Foundation—Mitsubishi’s comb filter is extremely effective. Before those corrections were made, the picture looked pretty good, but it displayed some anomalies that I couldn’t eliminate using the front-panel controls alone. ‘While the picture offered ample brightness and a creditably deep black level, the color was problematic. Flesh tones were overly orange, which suggested generally oversaturated color. 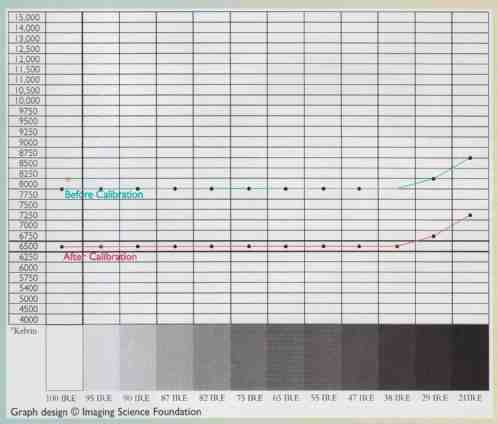 However, reducing the color level didn’t banish the orange cast, nor did shifting the tint away from red toward green. When I reset color and tint to their factory positions, I saw a generally rich and natural palette—Danny DeVito’s Ford Mustang in Twins shone a deep red and the detailed foliage in Fried Green Tomatoes boasted a wonderful range of greens and browns. But I was looking at orange people. Then an ISF-trained ghostbuster, John Gannon of AudioVideo Insight in Detroit, went to work and the pretty good picture was rendered spectacular. (See the sidebar for details.) By the time Cannon was finished, not only had flesh tone been restored to natural hues, but the greens and browns that had seemed so good were suddenly far more inflected and detailed. This new naturalism was in part due to adjustments in the color temperature, which not only removed a bluish hue from the picture, but made a stunning improvement in the black level. After Gannon’s correction, I experienced something I’d never seen on any television: pitch black bands at the top and bottom of letterboxed images. Rather than the familiar grayish bands that remind you you’re looking at a picture that doesn’t really fit the screen shape, this was a deeply etched image framed in a black so deep it might have been painted on. That convincing widescreen look prompted me to haul out several favorite letterboxed discs— Jurassic Park, Dances With Wolves, and Clear and Present Danger—each of which presented a new, vivid look more strongly evocative of cinema 4ian television. In every case, the deep colors and subtly inflected textures lent a depth to the overall image that was powerfully involving. And yet, thanks to the same qualities of naturalness and balance, the picture was uncommonly restful to look at hour after hour. For the picture alone—ultimately the only reason for buying any television — the CS-40805 proved to be a very appealing big-screen option. It is certainly the finest 40-inch monitor Mitsubishi has yet produced and thoroughly debunks any notion that a first- class picture can’t be achieved in so large a direct-view de sign. In addition, the CS-40805 boasts several amenities that sweeten the deal. Perhaps first on that list for many consumers is 2-tuner picture-in-picture. With a second tuner onboard, you don’t need to connect a VCR to keep an eye on one channel while watching another. 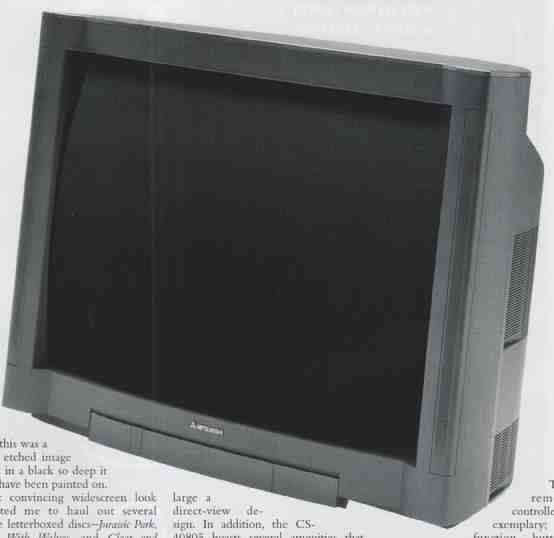 The set also features the StarSight onscreen TV program guide as well as Mitsubishi’s ViewPoint III onscreen menu, which makes all aspects of operation quick and cleat The set is well provided with audio/video inputs, on the front panel as well as the rear, including three video inputs. The internal sound system is the usual modest television scheme, and as usual I did not turn it on. The remote controller is exemplary; the function buttons are laid out in a logical fashion with secondary controls relegated to a sublevel accessed by sliding the remote’s top plate. In addition, the remote illuminates, a feature so obviously helpful that it should be standard, and it can operate several brands of VCRs and cable boxes. The Mitsubishi CS-40805 poses an exciting alternative to a larger rear-projection television representing a comparable investment. When the picture is correctly adjusted, it rivals the very best direct-view models I’ve seen. That grand, richly hued picture is absorbing and easy to look at. The experience was, in a word, stunning. Gannon said he was “very encouraged” by the overall picture of the Mitsubishi CS-40805 as it came out of the box. “In my experience, most Mitsubishi 35- and 40-inch models over the last couple of years have had color temperatures in the 11,000° to 13000° Kelvin range (compared with the NTSC standard of 6500° Kelvin). For this set to be in 8,000° range out of the box is surprising and marks a significant improvement. “I was reluctant to recommend Mitsubishi TVs, but this [ factory-set color temperature] has caused me to reconsider. Also, the set’s geometry [ ability to draw true circles and squares] is excellent”. Gannon also said he was impressed by the Mitsubishi’s menu-driven service controls, which are accessed with a sequence of numbers that you enter on the remote control. More than that, he praised the gradients of correction those controls allowed him to make. For example, he said it was uncommon for manufacturers to pro vide individual adjustments for each factory preset color-temperature set ting. However, Gannon was momentarily thrown by a discrepancy between color-temperature readings in the Service Menu mode and those taken when the television was restored to normal operation. After some trial- and-error guesswork, he was able to compensate for this curious shift and come up with the desired settings after exiting the service menu.